Marian Pauline Meyers, 85, formerly of Sidney, Ohio and recently of Ridgewood Health Campus, Legacy Wing, 181 Campus Dr., Lawrenceburg, Indiana, passed away on Saturday, May 20, 2017 at Dearborn County Hospital, Lawrenceburg, Indiana at 1:25 PM. She was born April 10, 1932 in Misnter, Ohio, the daughter of Henry and Florence (Weghorst) Wendeln and they are deceased. She was married to Frank A. Meyers on April 16, 1954 and he passed away on January 30, 1988. Surviving is a daughter, Lisa Meyers and husband Pete Lutikoff of Wadsworth, Ohio and a son, Greg Meyers and wife Beverly of Cincinnati, Ohio. Also surviving are five grandchildren and a sister, Jane Wilker of Montezuma, Ohio. One sister, Jo Albers and two brothers, Don Wendeln and Mel Wendeln are deceased. She was a member of the Sidney Moose Club, enjoyed golfing, was an an avid reader and walker, loved to play bridge and volunteered at Wilson Memorial Hospital. She worked for the Shelby County Probate Court for many years as a secretary. 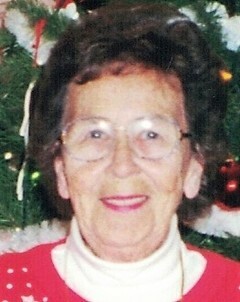 She was a member of Holy Angels Catholic Church in sidney, Ohio. A Mass of Christian Burial will be held on Thursday, May 25, 2017 at 10:30 AM at Holy Angels Catholic Church with Rev. James Riehle. Burial will follow at Graceland Cemetery, Sidney, Ohio. Friends may call at Salm-McGill and Tangeman Funeral Home in Sidney, Ohio on Thursday, May 25, 2017 from 9:00 AM until 10:15 Am. Memorial contributions may be made to the Shelby County Humane Society, Sidney, Ohio. Envelopes will be available at the funeral home.